Offering a fresh look at trade during the second industrial revolution, Global Markets Transformed describes a world of commodities on the move—wheat and rice, coffee and tobacco, oil and rubber, all jostling around the planet through a matrix of producers, processors, transporters, and buyers. Steven C. Topik and Allen Wells discuss how innovations in industrial and agricultural production, transportation, commerce, and finance transformed the world economy from 1870 to 1945. 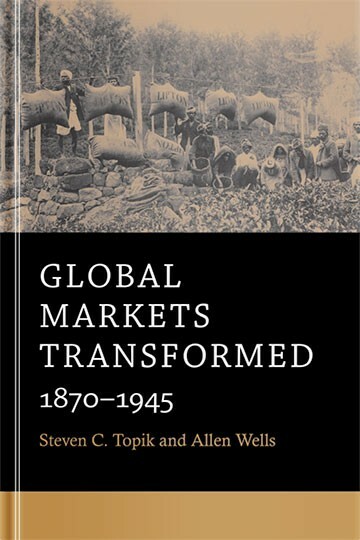 Topik and Wells trace the evolution of global chains of commodities, from basic food staples and stimulants to strategically important industrial materials, that linked the agricultural and mineral-producing areas of Latin America, Asia, and Africa to European and North American consumers and industrialists. People living a great distance apart became economically intertwined as never before. Yet laborers and consumers at opposite ends of commodity chains remained largely invisible to one another. Affluent American automobile owners who were creating the skyrocketing demand for tires, for example, knew almost nothing about poor Brazilian tappers who sweated in the Amazon to supply the rubber necessary for their vehicles. As commodity chains stretched out around the world, more goods were bound up in markets that benefited some countries more than others. Global Markets Transformed highlights the lessons and legacy of the early years of globalization—when the world’s population doubled, trade quadrupled, industrial output multiplied fivefold, and the gap between rich and poor regions grew ever wider.